Based in Hampsire in the south of England, Alison Williams has been writing since 1990. Her work has appeared in local magazines such as "Hampshire Today" and "Hampshire the County Magazine." Williams is qualified in newspaper journalism and has a Bachelor of Arts in English language and literature from the Open University. She has recently published her first novel "The Black Hours" and has a master's in creative writing. No-one’s divorce is the same. We are all different and divorce will affect us in different ways. But whatever your situation and the circumstances of your break-up, you are bound to feel some degree of emotion, be it stress, anger, fear or loss. It can help to know that the emotions you are feeling are normal and that they are experienced by others in your situation. Jean Poppe, MA, LPC, NCC states in an article for the Professional Consultants and Clinicians website that when going through a divorce, you experience a form of loss and it is natural to feel grief at that loss. You will grieve for the loss of a relationship you expected to last forever, and for a future you had planned but that now will not happen. Although not everyone will experience all or even any of the stages, it is useful to know how these stages work, and what to expect as or when you experience them. When you first make the decision to divorce, or have that decision thrust upon you, you may react by acting as though nothing has happened. You may carry on your normal life, going about your normal routines and refuse to believe the reality of what is happening in your life. This stage may also be characterized by a sense of shock or numbness at what has happened, and although you give the appearance of normality, you may, in fact, only be going through the motions. You are going through an enormous change in your life. You may have been hurt badly by the person you trusted most in the world, or may have had to accept that a marriage you have worked hard at is just not going to work. As the denial wears off, the reality of your situation begins to sink in. You will feel pain at the loss of your marriage and fear for what the future holds. You’re looking for someone to blame for this terrible thing that is happening in your life. You could have justifiable anger towards your ex-spouse. Or you may feel anger towards in-laws, parents, friends and even children. While it is normal to feel some degree of anger, if your feelings seem out of control or directed against the wrong people, your children in particular, then you should seek professional help. You may also have to deal with the anger of others – your children will be having these feelings, and may blame you for the family break-up, or your ex may feel angry at you if you have instigated the divorce. It is normal to try to avoid the inevitability of the end of a marriage by bargaining, either with your ex-spouse or with yourself. You may promise to change certain behaviors if only you can have another chance. This is because you want to try and stop the pain you are feeling and can also be an attempt to take back some control over the situation. 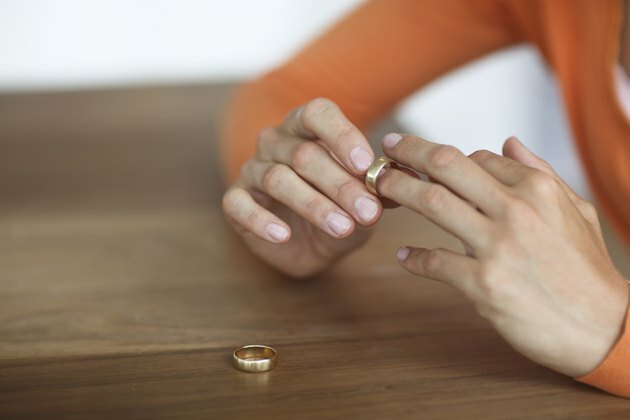 Your divorce might not be your fault. Equally, you may not be able to lay the blame squarely at your ex’s door. However, at this stage it is normal to think about how you could have done things differently, how you could have prevented situations and made your marriage work. At this stage, we question the effort we made at marriage and our behavior. This can result in an overwhelming need to turn back the clock, to make things better. It is entirely normal to feel some degree of depression when going through a divorce. You may find it hard to sleep even though you feel physically and mentally exhausted. You could lose your appetite or overeat. Being short-tempered and snappy with those close to you is also normal. Remember that others involved could also be feeling like this, particularly any children involved. If these symptoms seem very severe or go on for a long time, in either you or your children, then seek medical help. At some point you will begin to accept the situation. You will realise that life has changed and that it will not return to how it was. Despite this, you feel okay and know that you can move on. Embrace this strength and allow yourself to believe in your ability to be resilient, to cope, and to survive. You will know that you can start a new life, and although that might seem scary, the experiences you have been through will help you to carry on.